Nemaster grandis, copyright Edgardo Ochoa. 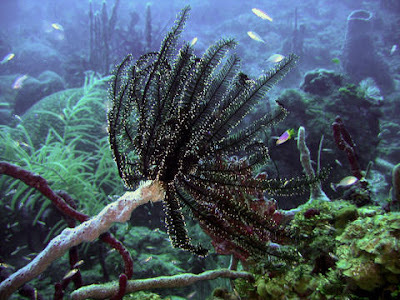 The Capillasterinae are a group of feather stars with a low centrodorsal and usually numerous cirri, with dorsal spines or tubercles on the distal cirri (Wienberg Rasmussen 1978). Characters (from Wienberg Rasmussen 1978): Centrodorsal rather low discoidal. Cirri rather numerous, in one to three irregular circles. Distal cirrals with dorsal spine or tubercle. Centrodorsal reduced and cirrus-free only in a single species of Capillaster. Articular face of radials with interarticular ligament fossae much wider than high. Border between interarticular and ventral fossae horrizontal or sloping toward interradial edge. Ventral muscular fossae more or less extended outward at interradial margin. Arms divided at primibrachs 2 and commonly further divided at secundibrachs 2, seldom at secundibrachs 1,3, or 4 and tertibrachs 2, 3, or 4. Synarthrial articulation at primibrachs 1 to 2, secundibrachs 1 to 2 and often tertibrachs 1 to 2. Mouth generally excentric to marginal, occasionally central. [W79] Warner, G. F. 1979. Aggregation in echinoderms. In: Larwood, G., & B. R. Rosen (eds) Biology and Systematics of Colonial Organisms pp. 375–396. Academic Press: London.